Gorgeous home in the heart of town - walk to restaurants, events, track & more! 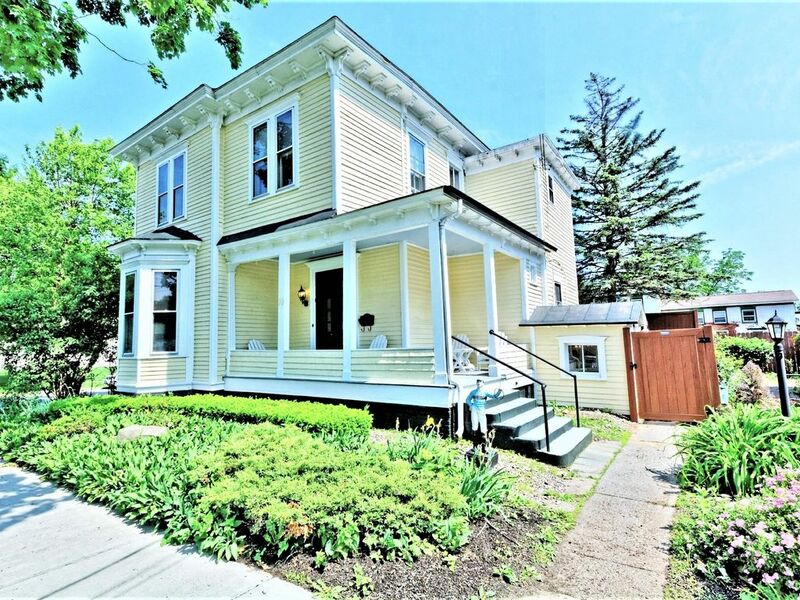 This gorgeous property is located a short two blocks from the all the restaurants, shops and entertainment in downtown Saratoga Springs allowing great walkability to the track, festivals and all that The Spa City has to offer. Come enjoy your home away from home with the expansive living offered by this Victorian. You’ll enjoy a variety of features and amenities including two kitchens for those big retreats or family gatherings, large dining room, living room, 5 bedrooms, 2.5 baths, front porch, rear yard with a propane grill and outdoor furniture, Free WiFi and much more. This historic home is located within walking distance to incredible dining, shopping, art & culture, entertainment, Saratoga Race Course, Saratoga Performing Arts Center, Saratoga Spa State Park, Saratoga National Historical Park, Saratoga Golf Courses, Saratoga's Museums, Mineral Springs, Saratoga's Spas, Saratoga Polo, Saratoga Casino and Raceway, Skidmore College, local hot spots & music, wine tasting and more…come, relax and enjoy Saratoga’s treasures! Easy access to it all…Saratoga Race Course, Saratoga Performing Arts Center, Saratoga Spa State Park, Saratoga National Historical Park, Saratoga Golf Courses, Saratoga's Museums, Spas, Mineral Springs and much more! o	Ravenous: Ravenous is downtown Saratoga’s only crepe restaurant. o	Esperanto: Foods from around the world, Greece, Mexican, Middle Eastern , Thailand and others. So many places and events to enjoy...: •	Saratoga Race Course: Also know as Saratoga Racetrack or 'the flat track', Saratoga Race Course is the oldest continually operating Thoroughbred horse racing track in the United States. The track is home to the Travers Stakes, 'America's Mid-Summer Derby' which occurs in late August. •	Saratoga Performing Arts Center: Referred to locals and frequent visitors as 'SPAC', this outdoor performing arts venue features classical performances, the Saratoga Jazz Festival, the Saratoga Wine and Food Festival and major pop and rock concerts. It is the summer home of the New York City Ballet and The Philadelphia Orchestra. •	Saratoga Casino and Raceway: With over 1,000 video gaming machines, harness racing and a night club, Saratoga Casino and Raceway has plenty going on. Just be sure to bring your good luck charms! It's time to get away and enjoy the charm! : Character, history, and charm are just a few of the reasons Saratoga was named as one of America’s Dozen Distinctive Destinations by the National Trust for Historic Preservation. However, this sort of acclaim is nothing new to Saratoga. For centuries, Saratoga Springs has been a premier destination. Discover all there is to see and do here, from world-famous horse racing at Saratoga Race Course during the summer to award-winning golf. There is so much to do in Saratoga...the perfect place for your next getaway! Located just two blocks from the center of town. You can park your car at the house and walk to restaurants, events, shopping, spas and all that Saratoga Springs has to offer. Just a short distance to beautiful Saratoga Lake! Automatic drip coffee maker. Coffee filters are provided…just bring your favorite blend of coffee! Two beautifully equipped full-sized kitchens! Dining room table seats 10. Kitchen island seats another 4. Rear and front porch provided with outdoor furniture. Beautiful home close to main street shopping and restaurants. Close to race track. Much enjoyed our stay. Loved the house it’s so charming. And loved loved loved the location. We (eight adults and two children) fit very comfortably in the home. The location was very close to town and the supermarket. The track was a short drive (Uber) or a twenty minute walk. The kitchen had everything and anything. We had six guests over one night for dinner and we all fit very comfortably in the kitchen and dining room. Home was really beautiful and spacious. We used the grill everyday. The stair cases would be tough for elderly people. We loved how close to track and downtown for the bars and restaurants. The house set up was good for our group of 10 and cute little yard to grill and sit. We spent most of our time at track then enjoying the front porch having some cocktails and chatting, however if we wanted bar action we only had to walk a few blocks. There is a cute coffee shop around the corner along with a grocery store. We plan on renting this house again next year. Thank you Nick & Lynn. Lovely historic home in a great location and an awesome host! Worked perfectly for our needs. This gorgeous property is located a short two blocks from the center of downtown Saratoga Springs allowing incredible walkability to the track, festivals and all that The Spa City has to offer. Come enjoy your home away from home with the expansive living offered by this Victorian. You’ll enjoy a variety of features and amenities including two kitchens for those big retreats or family gatherings, large dining room, living room, 5 bedrooms, 2.5 baths, front porch, rear yard with a propane grill and outdoor furniture, WiFi and much more.